Our academic program builds foundational knowledge and integrates the development of transferable skills like collaboration, creativity, resilience, critical thinking, problem solving, initiative and entrepreneurship. Compelling courses and Signature Programs, led by our dedicated and impassioned faculty, give our students transformational experiences and prepare them for success in college and life. Our curriculum blends challenging college prep coursework with exciting learning opportunities you won’t find at any other school. We’re the only high school that offers cancer immunology courses and our students conduct research at Case Western University and the Cleveland Clinic. We’ve also been named the best school in the state for STEM, thanks to our Wang Innovation Center, a 6,000-square-foot collaborative learning space. Our innovative daily schedule allows for deeper learning, labs, group work, research and projects. The rotating schedule includes four 75-minute meetings per course every seven-day cycle. A built-in Academic Plus (A+) period, one hour when no classes are scheduled, gives students time for community, collaboration, guest speakers, extra help and study. Our robust athletics program invites all students to participate in sports and includes 45 separate interscholastic teams in 24 sports. Classes in yoga, dance, tai chi and weightlifting provide alternative ways of staying active and fit. Additionally, our arts program presents numerous opportunities for performances in dance, music, theater and showings in the visual arts. 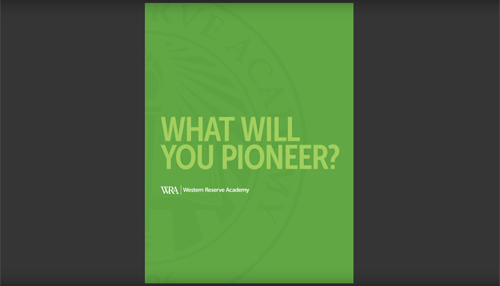 From novice to expert, the athlete and the artist are given every opportunity at WRA. Student Life at Reserve means leading, dreaming and finding new adventures. It involves everything you do here. Like pursuing your passions in clubs, through leadership opportunities, during weekend activities and as part of daily community gatherings. Student Life also is your avenue to peace and balance... quiet time in the library, dance parties in the dorm with friends, walks to downtown Hudson to the coffee shop or yoga studio, hikes in the nearby National Park. Located in Hudson, Reserve’s 190-acre campus was recently named the most beautiful private high school in Ohio by Architectural Digest. The town of Hudson is a safe extension of our campus, as it combines a small town charm with the welcoming spirit of the Midwest and the conveniences of close-by cities. Our students appreciate the short walk to Hudson’s beautiful town center for dinner or ice cream with friends. We are also a short ride to the Cuyahoga Valley National Park and Cleveland. Our prime location allows for amazing educational and recreational opportunities both on and off campus. WRA is less than two-hour flight time from Chicago, Detroit, Toronto, Boston, New York City, Philadelphia and Washington, D.C. If you think Reserve might be right for you, we’d love to show you more of what we have to offer. To learn more or schedule a visit, please contact Jordan Shriver, Associate Director of Admission, Coordinator of International Admission at 330-650-9790 or [email protected].